You know when someone tells you not to do something and you do it anyway? Well, that just about sums up my first foray into fresh cheese making with the curding agent, rennet. I won’t make excuses, but just say that this is probably a behaviorial hangover from my youth where questioning authority was de rigueur. I had been thinking about rennet cheese making ever since posting my experiments on homemade ricotta. Usually, I do a lot of research before delving into a new project. In this case, I met with contradictory information out there on the internet (not surprising, really, given the nature of the media). There were numerous authoritative sites peppered with scientific detail, but then there were what I like to call grassroots sites with laid back attitudes. One emphatically said do not use bog-standard, readily available in the supermarket, cheap, junket-making rennet, the other said “why not?”. You can probably guess which one I initially sided with. So, first attempt, after getting the book, The Creamery Kitchen by Jenny Linford, was to pick a recipe and delve in. I chose feta since it is a cheese we eat a lot, particularly in the summer months with all those Greek salads. In the list of ingredients was “cheesemaking rennet”, but nowhere in the book did it describe exactly what was meant by this term. Nor, were there any specific injunctions on using junket rennet. So, falling back on those laid back, lazy recommendations, I simply used the rennet I had to hand – namely rennet from the supermarket sold specifically to make that wobbly, milky, custard-like British pudding called junket. After seeing the soft, creamy, non-feta results, I silently apologized to all those scientific sites out there that advised against junket rennet. Yes, there is a difference! It has something to do with the percentages of enzymes called chymosin and pepsin, as I discovered. Cheese rennet is 80% chymosin – 20% pepsin, while junket rennet is the opposite. Naturally it is the chymosin which is the significant and strong curding agent for making cheese. Don’t worry, it didn’t go to waste – the creamy cheese made a perfect filling for my herb popovers. Now in possession of proper (80% chymosin) cheese rennet (from The Cheesemaking Shop listed as one of the suppliers in The Creamery Kitchen), I was ready to make cheese. I’ll gloss over batches two and three. However, I will say that, in both cases, there was an improvement over the first attempt – both batches eventually made a solid cheese which I was able to salt. Attempt four…well, let’s draw a complete blank over that, but at that point my husband did suggest that I might have to cut my losses and admit that any thoughts of becoming a Greek shepherd would not be realized. Did I listen? Of course I listened, but…listening isn’t the same as doing. Thankfully, batch five was cooperative and tranquility was restored. Little things were learned at each attempt – to do with handling the ingredients, timing, and also equipment. I’m sure there’s much more to learn and I must say that having found Chicago John’s @ From the Bartolini Kitchens list of reasons why things can go wrong with feta cheese making, really helped me to understand what to look out for. But, I’ve also learned that no matter how many times you make this cheese, there is always the potential for some new twist on things that can go wrong, but understanding the nature of the ingredients and the process, it becomes easier to correct those mistakes. Still, sometimes you just need to take things philosophically and start over – one reason why John’s list of things that could go wrong ended with: “The Fates are messing with you.” How true! I originally based the recipe in The Creamery Kitchen, but have made modifications based on things learned – particularly from Chicago John (see link above). Once various matters were clarified, I found using The Creamery Kitchen a real delight – lots of simple, easy to make homemade dairy products like butter, buttermilk, yoghurt, all sorts of soft creams and cheeses. Feta, however, is a slightly more involved and lengthy a process than indicated in the book. Read through my instructions (and advice based on experience) first before attempting making your own feta. It is part science, part art and not for the faint-hearted! Put the milk into a large pot and turn the heat on low. You can use regular full-fat cow milk, but the resulting cheese won’t be as tangy. Using a cooking thermometer, let it heat until it reaches no more than 90 degrees F. (32 degrees C.) although some sites say no more than 88 degrees F. and others say that rennet thrives at temperatures from 85 to 105 degrees F. Also, some sources indicate that candy/sugar thermometers tend not to be as accurate as good quality kitchen thermometers, others say it is okay to use candy thermometers. Your choice! I used the only cooking thermometer I had to hand – a candy thermometer – and took the pot off the heat the minute the mercury started to rise, before it reached the 100 degree F. mark. 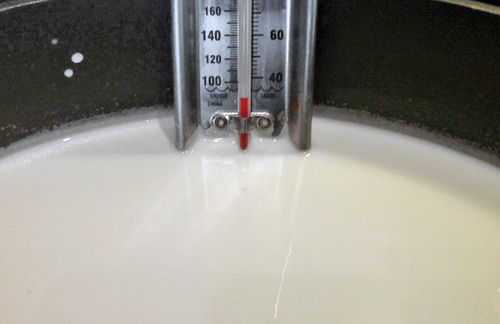 This heating process simply warms the milk as you do not want to kill the live culture in the yoghurt. Take off heat and add the yoghurt that you’ve diluted in a little of the warm milk. Stir throughly, cover and let the pot sit in a warm, draft free place for 1 hour. Meanwhile, boil some filtered or bottled water – do not use tap water directly – and measure out 2 Tablespoons and set this aside in a small dish to cool. Tap water may be chlorinated which reacts against the setting of the curd. When cool, add the rennet to the water. 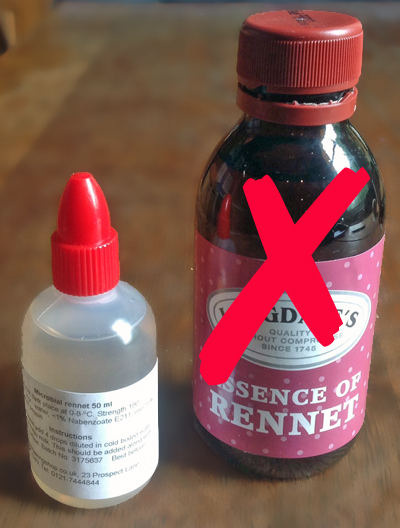 Once the milk has had its hour rest, add the rennet water to the milk. Stir well, cover and set aside for about 3 to 4 hours in a warm place, until a “clean break” forms. You can test if the curds form a “clean break” by inserting your finger into the curds at an angle and lifting. The curd should lift and will be firmly set. If not let it sit for another hour. After allowing the rennet time to work, use a large kitchen knife or palate knife to cut a cross-hatch pattern in the curd, making small (approximately 1 to 1/2 inch) squares. Then, gently stir with a large metal spoon to cut the curd into smaller pieces. Place the lid back on and let it sit for half an hour. 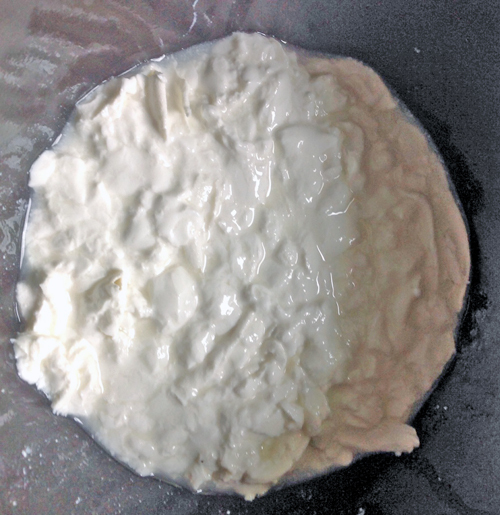 The curds should shrink slightly and begin to separate from the yellowish liquid whey. While waiting for the cut curds to settle, line a colander with your cheese cloth or loose weave jam muslin. Do not be tempted to improvise with the cloth – something which is okay when making ricotta which produces firmer curds with lemon juice (or vinegar). Rennet produced curds are softer and only semi-solid. If you are using vegetarian rennet (like I was), it produces in an even softer curd. Also see note on calcium chloride below as this relates to curd consistency. 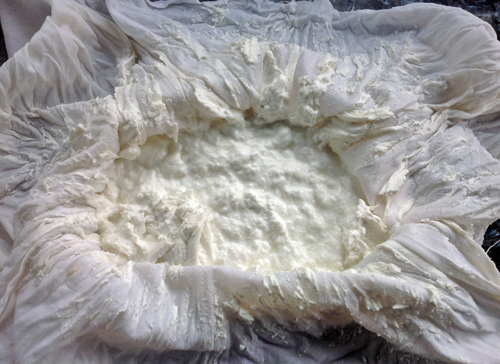 With soft curds, you will need a proper less-densely woven cloth to allow the curds to fully drain. Place the colander over a deep bowl so that it can collect the whey. When the curds have settled, gently spoon the contents of the pot into the lined colander. After about 30 minutes, when a portion of the whey has drained, gather up the four corners of your cloth, tie and suspend over the bowl to allow the curds to drain further – until it loses its “wet soupy” look. The curds should be the nice and white and resemble a soft cottage cheese. It can take 4 hours… or many more. I left mine suspended in a cool place overnight. Be patient at this stage as it is important to remove as much of the whey as possible before shaping and pressing. Pour the reserved whey into containers and refrigerate for future use (see notes below). Take the curds out of the cloth and put into a bowl, gently mixing in 1/2 teaspoon of the salt. 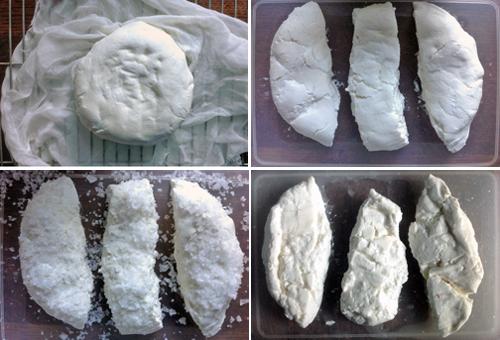 Spoon the curds into a cloth lined mould – using a second dry, clean muslin. The mould can be a special cheese making mould, or you can improvise as long as it is very clean and had drainage holes. 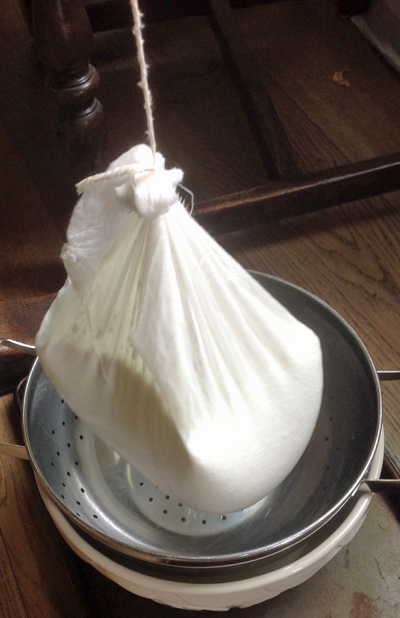 (See the link above to Chicago John’s post to see how to use a large tin can as an improvised cheese mould.) 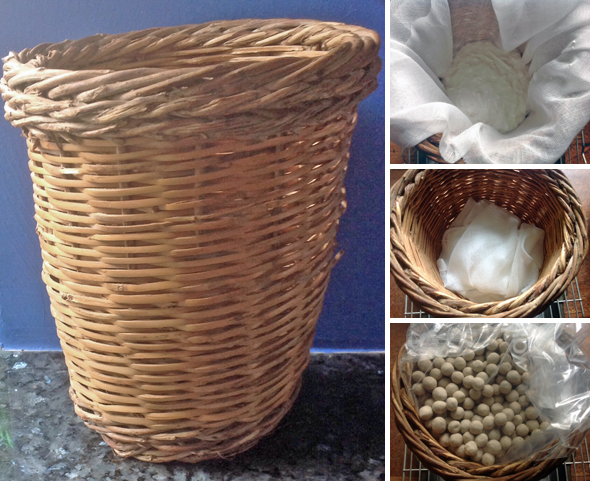 I used my traditional Greek cheese basket, lined with a clean cheesecloth. The basket is woven from split olive strips and willow, a very specific design similar in shape and function to the plastic cheese moulds. Fold the cloth over the curds and place a weight over top. I used a plastic bag filled with my ceramic pie weights. Place the container in a cool place, on a cooling rack over a bowl or tray to catch any dripping whey. Leave for 24 hours. Check to see if the feta has firmed. It should still be soft, but firm enough to hold together in a block. If not, apply more weights and check every 6 hours to see if it is ready to remove from the mould. The general rule of thumb is more weight and more pressure, the firmer the cheese block. Once firm enough to handle, take the block of soft cheese, cut it into 3 thick slices and and place in a sealable container, sprinkling 2 of the tablespoons of sea salt over one side, flip and then sprinkle the other 2 tablespoons of salt on the other side. Cover and let sit at room temperature for 24 hours, flipping the slices halfway through. You will notice that the cheese begins to firm up, the salt turning to brine as it draws out more liquid. Take the cheese out and pat dry with paper towels. 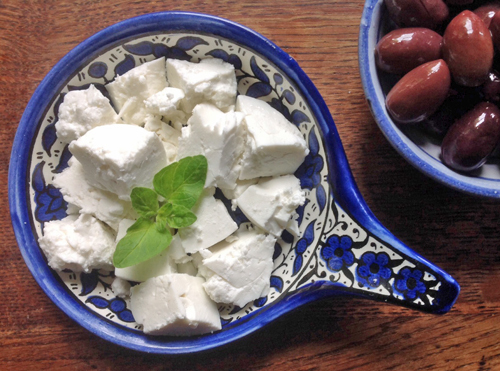 To preserve the feta, either submerge in olive oil or put in brine. If your cheese is slightly soft, as mine was due (probably) to the vegetarian rennet, it may be wise to store in brine rather than olive oil. To make the brine, simply take some of the reserved whey (or water) and add about 5 Tablespoons of salt to 16 oz. of whey. Obviously the brine solution will add to the saltiness of the taste, but as it ages it will become firmer and more crumbly. Stored in the refrigerator, the feta will last up to 3 months in brine, 1 month or less in oil. Will I make feta again? Sure! The flavour of fresh dairy is great. And, when it works, the process gives you a sense of something well done – a positive accomplishment. Even though it wasn’t as easy as described in The Creamery Kitchen, I would never have attempted it without the book. So thank you, Selma for bringing the book to my attention! Sometimes you just have to take the plunge and see where it leads you – a perpetual work-in-progress. And, I have to admit, cheese making is addictive. Next: continue refining the feta making, then mozzarella! 1. Rennet, a complex of enzymes, is traditionally rendered from calf stomachs, but there are vegetarian rennet options also available. For all but the first batch, I used a Vegetarian microbial rennet which is said to be of greater strength than natural non-vegetarian rennet. Vegetarian rennets are also known to produce slightly softer curds. 2. 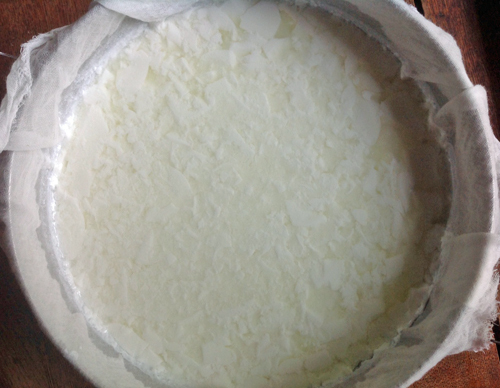 Some authorities indicate the addition of calcium chloride to the milk will help to form a firmer curd. This salt compound rebalances the calcium content in store-bought, homogenised, pasteurised milk. Apparently, it is particularly needed with goat’s milk. I will definitely be trying calcium chloride in future and may cut down on the time it takes for the curd to drain. 3. The tenets of cheese making: cleanliness (particularly with the equipment used), proper equipment (although don’t rule out improvising on some things), ingredients that are fresh and correct for the job, and finally, patience to time the stages correctly. 4. Re-use the whey! This is a sweet whey, so can be used as a drink or even a hair rinse. I’ve also seen sweet whey used as a spray on plants with powdery mildew – something gardeners in damp Britain are well aware of! This whey can also be used in the same way as an acid whey, some of which I listed in my post Repurpose the Whey. I’ve now used some of the gallons of whey produced to soak dried beans – highly recommended! 5. 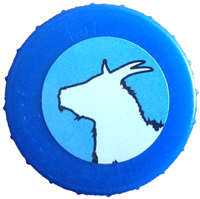 In 2002, feta made in Greece was awarded the coveted Appellation d’origine contrôlée (AOC) by the European Commission. The AOC determined that feta can only be called feta if produced from sheep or goat’s milk, made to a certain standard, from animals that grazed in certain parts of Greece (Epirus, Macedonia, Thrace, Thessaly, Sterea Peloponnese and Mytilene). “Feta” from other areas, even if those areas had been making similar cheeses for generations, became Feta-style or Feta-like cheeses – or even “white brine cheese” or “crumbly salad cheese”. I like that – rennet rebel! Much better than cheesy nonconformist. I’d much rather learn by trial and error, getting my hands dirty (as the saying goes). I feel more confident now knowing the properties of the ingredients and how the process works. I don’t think I would have if everything had worked the first time around. We’ll see what happens with batch 6…but only after we’ve got through this current feta glut! Cheesy adventures – sounds like a title of a book. Yes, it is an ongoing adventure – much like yours and bread making. Always new things to learn! G’day and really enjoyed your post today! Having made cheese before, I know what a sense of accomplishment one feels when things work! Thanks Joanne! It certainly does give you a sense of accomplishment – when it works, that is. And, as you probably know, it is addictive – like bread making and brewing homemade wines. Loved this post Deb, you are truly intrepid in the kitchen!! I admire both your persistence and perseverance. Not sure I’d bother making cheese, too easy to buy good locally produced varieties. I have a friend who regularly makes camembert…. I guess it was more for the adventure than anything else. 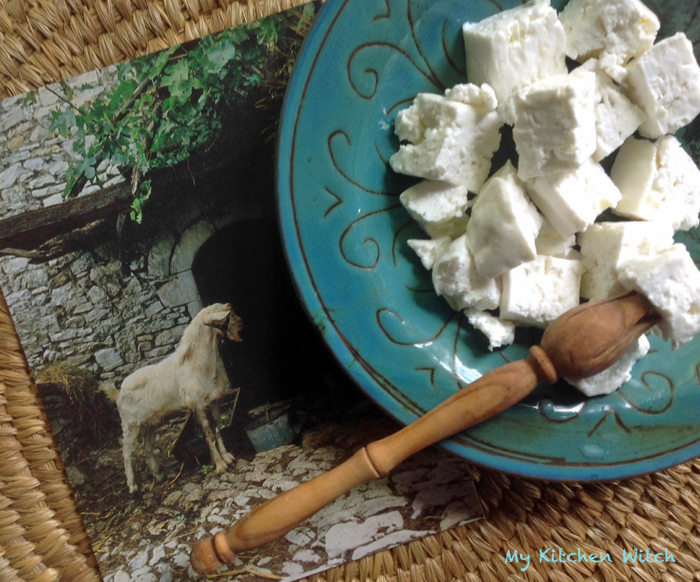 Yes, I can buy good feta (and I mean the “real” feta from Greece), but there is a satisfaction to producing your own. And, I now have a summer’s supply of feta! Other cheeses that require specific cultures and long processes I will leave up to the experts, but fresh cheeses and dairy like ricotta, mascarpone, and even Mozarella are doable. You have encouraged me…maybe I should try my hand at cheese. Thanks for the excellent tutorial…love John’s posts as well with all of their information. John’s instructions are really great and I was so glad I found it – as it dates back a few years. Cheese making is a very rewarding process (when it works!). I’m now looking longingly at images of lovely wooden cheese presses which I might put on my Christmas list. You make yoghurt – and this is just one step further! I think you will enjoy making cheese. Thanks for the book recommendation; it certainly looks interesting. I ran across the cheese forum when I was doing my internet research – lots of detail there! I love goat’s cheese and camembert, but I think I’ll try perfecting the feta and then mozzarella – both of which do not require specific cultures. Then, who knows? A really detailed post Debi – thanks for all the additional information too. I guess that will the lay-out of the book there wasn’t much room for detail – which is naughty! It is still a useful book – at least for the fresh dairy recipes mentioned earlier in the book. And, it is pretty! The layout and pics are lovely – have you ever tried to photograph white on white? Difficult. I also think the lack of detail is designed not to put people off doing something that may seem too complex, and to make it seem fun to do. But, as you say, naughty, since it doesn’t help in the long run. Feta seems to be the most complicated recipe in the book. Leave it to me to choose that one to start! Have you tried making anything from it yet? I am glad I got it. I have made cheese, but never feta. All your experiments are very helpful in giving me some ideas to minimize failure. I do like the results of my own home-made varieties, so should give this a try. I guess that’s the key to any new enterprise – minimise failure. Plus, I actually did have fun in the process and (for the most part) was pleased with the results. I am curious – what types of cheese do you make? Much more fun than high school science experiments but hard work. Well done for doing it and living to tell the tale in this post. You are braver and more persistant than I would be ! Well put – “living to tell the tale”! Yes, it certainly felt like that. I feel as though I’ve come through the experiment with a certain degree of knowledge, plus an awareness that there is still much more to learn in even simple cheese making. I will make feta again, but need to eat a lot more Greek salads to get through the current glut! This post is really useful! ….i tried to make Halloumi, cos i love it and can’t find it easily over here… i boght the essence of rennet you placed a red cross on… and maybe now I understand a bit more why it didn’t work! It was a real saga – I mean IS a saga since I don’t think I will ever be finished exploring cheese making. Working with rennet is a lot different than simply producing curd with lemon juice or vinegar. Having tips to work from really helps. It took me a while to get here but I didn’t want your efforts to go without comment. Congratulations! Feta is not an easy cheese to make and you did a fantastic job! Loved the comment “… no matter how many times you make this cheese, there is always the potential for some new twist on things that can go wrong…” How true! I’m glad you persevered, though. What a sense of accomplishment, eh? Thanks for your kind words and shout out. I’m glad you found the post helpful. I cannot tell you how helpful your post on feta making was. I actually have it bookmarked! You are absolutely right, feta is not an easy cheese to make, but I am glad that I persisted. I really have to get hold of some calcium chloride for the next batch. I think it might help. I’ve also been eyeing lovely wooden cheese presses – put on the wishlist! Achieving the right amount of pressure when pressing is tricky when you improvise. The basket I used is a traditional one for Greek mizythra – a close cousin to ricotta, so not really meant to be used for harder cheeses. But, you learn as you go on.